This month, we were delighted to be involved with the 2018 edition of the Settle Stories Festival. Nestled into the heart of the Dales, Settle boasts scenic views and community spirit. This first came to our attention when the town’s residents took their local vendor, Alan, under their wing. Settle Stories was keen to have real-life stories to go alongside its programme of traditional performance storytelling. So, needless to say, when the festival reached out to us to join their 2018 line up, we were happy to accept. Our team delivered an hour long talk on the support we provide to those who are homeless, vulnerably housed or have little other means of generating an income. The talk featured input from a special guest, Alan – and who can tell our story better than one of our vendors? After the talk, we moved into a gazebo in the town square for the afternoon, explaining more about our work to the festival-goers. We were again joined by Alan, who was selling the magazine using his new cashless payment machine. 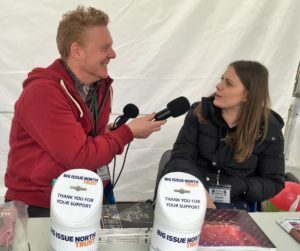 While at the festival, we also spoke to Drystone Radio about our involvement in Settle Stories and shared more vendor stories. Our interview on the show The Writer’s Bookshelf will be aired at a later date in May. We would like to take this opportunity to thank all those who attended our session and to the organisers, volunteers and attendees of this fantastic event! We’re always looking for new opportunities to raise awareness of our vendors.